Androgenetic redirects here. For hair loss see Androgenetic alopecia. Not to be confused with automixis or autogamy. This article is about plants. For similar processes in animals and Oomycetes, see Parthenogenesis. In botany, apomixis was defined by Hans Winkler as replacement of the normal sexual reproduction by asexual reproduction, without fertilization. Its etymology is Greek for "away from" + "mixing". This definition notably does not mention meiosis. Thus "normal asexual reproduction" of plants, such as propagation from cuttings or leaves, has never been considered to be apomixis, but replacement of the seed by a plantlet or replacement of the flower by bulbils are types of apomixis. Apomictically produced offspring are genetically identical to the parent plant. Some authors included all forms of asexual reproduction within apomixis, but that generalization of the term has since died out. In flowering plants, the term "apomixis" is commonly used in a restricted sense to mean agamospermy, i.e. clonal reproduction through seeds. Although agamospermy could theoretically occur in gymnosperms, it appears to be absent in that group. Apogamy is a related term that has had various meanings over time. In plants with independent gametophytes (notably ferns), the term is still used interchangeably with "apomixis", and both refer to the formation of sporophytes by parthenogenesis of gametophyte cells. Male apomixis (paternal apomixis) involves replacement of the genetic material of the egg cell by that from the pollen. Because apomictic plants are genetically identical from one generation to the next, each lineage has some of the characters of a true species, maintaining distinctions from other apomictic lineages within the same genus, while having much smaller differences than is normal between species of most genera. They are therefore often called microspecies. In some genera, it is possible to identify and name hundreds or even thousands of microspecies, which may be grouped together as species aggregates, typically listed in floras with the convention "Genus species agg." (such as the bramble, Rubus fruticosus agg.). In some plant families, genera with apomixis are quite common, for example in Asteraceae, Poaceae, and Rosaceae. Examples of apomixis can be found in the genera Crataegus (hawthorns), Amelanchier (shadbush), Sorbus (rowans and whitebeams), Rubus (brambles or blackberries), Poa (meadow grasses), Nardus stricta (Matgrass), Hieracium (hawkweeds) and Taraxacum (dandelions). The apomicts actually have discovered the effectiveness of mass production long before Mr Henry Ford applied it to the production of the automobile. ... Facultative apomixis ... does not prevent variation; rather, it multiplies certain varietal products. Facultative apomixis means that apomixis does not always occur, i.e. sexual reproduction can also happen. It appears likely that all apomixis in plants is facultative; in other words, that "obligate apomixis" is an artifact of insufficient observation (missing uncommon sexual reproduction). The gametophytes of bryophytes, and less commonly ferns and lycopods can develop a group of cells that grow to look like a sporophyte of the species but with the ploidy level of the gametophyte, a phenomenon known as apogamy. The sporophytes of plants of these groups may also have the ability to form a plant that looks like a gametophyte but with the ploidy level of the sporophyte, a phenomenon known as apospory. See also Androgenesis and androclinesis described below, a type of male apomixis that occurs in a conifer, Cupressus dupreziana. Agamospermy, asexual reproduction through seeds, occurs in flowering plants through many different mechanisms and a simple hierarchical classification of the different types is not possible. Consequently, there are almost as many different usages of terminology for apomixis in angiosperms as there are authors on the subject. For English speakers, Maheshwari 1950 is very influential. German speakers might prefer to consult Rutishauser 1967. Some older text books on the basis of misinformation (that the egg cell in a meiotically unreduced gametophyte can never be fertilized) attempted to reform the terminology to match parthenogenesis as it is used in zoology, and this continues to cause much confusion. Agamospermy occurs mainly in two forms: In gametophytic apomixis, the embryo arises from an unfertilized egg cell (i.e. by parthenogenesis) in a gametophyte that was produced from a cell that did not complete meiosis. In adventitious embryony (sporophytic apomixis), an embryo is formed directly (not from a gametophyte) from nucellus or integument tissue (see nucellar embryony). Caribbean Agave producing plantlets on the old flower stem. Nonrecurrent apomixis: In this type "the megaspore mother cell undergoes the usual meiotic divisions and a haploid embryo sac [megagametophyte] is formed. The new embryo may then arise either from the egg (haploid parthenogenesis) or from some other cell of the gametophyte (haploid apogamy)." The haploid plants have half as many chromosomes as the mother plant, and "the process is not repeated from one generation to another" (which is why it is called nonrecurrent). See also parthenogenesis and apogamy below. Recurrent apomixis, is now more often called gametophytic apomixis: In this type, the megagametophyte has the same number of chromosomes as the mother plant because meiosis was not completed. It generally arises either from an archesporial cell or from some other part of the nucellus. Adventive embryony, also called sporophytic apomixis, sporophytic budding, or nucellar embryony: Here there may be a megagametophyte in the ovule, but the embryos do not arise from the cells of the gametophyte; they arise from cells of nucellus or the integument. Adventive embryony is important in several species of Citrus, in Garcinia, Euphorbia dulcis, Mangifera indica etc. Vegetative apomixis: In this type "the flowers are replaced by bulbils or other vegetative propagules which frequently germinate while still on the plant". Vegetative apomixis is important in Allium, Fragaria, Agave, and some grasses, among others. Gametophytic apomixis in flowering plants develops in several different ways. A megagametophyte develops with an egg cell within it that develops into an embryo through parthenogenesis. The central cell of the megagametophyte may require fertilization to form the endosperm, pseudogamous gametophytic apomixis, or in autonomous gametophytic apomixis fertilization is not required. In diplospory (also called generative apospory), the megagametophyte arises from a cell of the archesporium. In apospory (also called somatic apospory), the megagametophyte arises from some other nucellus cell. Considerable confusion has resulted because diplospory is often defined to involve the megaspore mother cell only, but a number of plant families have a multicellular archesporium and the megagametophyte could originate from another archesporium cell. Allium odorum–A. nutans type. The chromosomes double (endomitosis) and then meiosis proceeds in an unusual way, with the chromosome copies pairing up (rather than the original maternal and paternal copies pairing up). Taraxacum type: Meiosis I fails to complete, meiosis II creates two cells, one of which degenerates; three mitotic divisions form the megagametophyte. Ixeris type: Meiosis I fails to complete; three rounds of nuclear division occur without cell-wall formation; wall formation then occurs. Blumea–Elymus types: A mitotic division is followed by degeneration of one cell; three mitotic divisions form the megagametophyte. Antennaria–Hieracium types: three mitotic divisions form the megagametophyte. 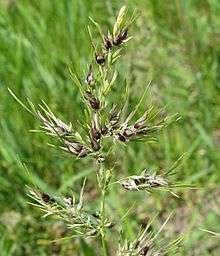 Eragrostis–Panicum types: Two mitotic division give a 4-nucleate megagametophyte, with cell walls to form either three or four cells. Apomixis occurs in at least 33 families of flowering plants, and has evolved multiple times from sexual relatives. Apomictic species or individual plants often have a hybrid origin, and are usually polyploid. In plants with both apomictic and meiotic embryology, the proportion of the different types can differ at different times of year, and photoperiod can also change the proportion. It appears unlikely that there are any truly completely apomictic plants, as low rates of sexual reproduction have been found in several species that were previously thought to be entirely apomictic. The genetic control of apomixis can involve a single genetic change that affects all the major developmental components, formation of the megagametophyte, parthenogenesis of the egg cell, and endosperm development. However, the timing of the various developmental processes is critical to successful development of an apomictic seed, and the timing can be affected by multiple genetic factors. Apomeiosis: "Without meiosis"; usually meaning the production of a meiotically unreduced gametophyte. Haploid parthenogenesis: Parthenogenesis of a normal haploid egg (a meiotically reduced egg) into an embryo is termed haploid parthenogenesis. If the mother plant was diploid, then the haploid embryo that results is monoploid, and the plant that grows from the embryo is sterile. If they are not sterile, they are sometimes useful to plant breeders (especially in potato breeding, see dihaploidy). This type of apomixis has been recorded in Solanum nigrum, Lilium spp., Orchis maculata, Nicotiana tabacum, etc. Diploid parthenogenesis: When the megagametophyte develops without completing meiosis, so that the megagametophyte and all cells within it are meiotically unreduced (a.k.a. diploid, but diploid is an ambiguous term), this is called diploid parthenogenesis, and the plant that develops from the embryo will have the same number of chromosomes as the mother plant. Diploid parthenogenesis is a component process of gametophytic apomixis (see above). Androgenesis and androclinesis are synonyms. These terms are used for two different processes that both have the effect of producing an embryo that has "male inheritance". The first process is a natural one. It may also be referred to as male apomixis or paternal apomixis. It involves fusion of the male and female gametes and replacement of the female nucleus by the male nucleus. This has been noted as a rare phenomenon in many plants (e.g. Nicotiana and Crepis), and occurs as the regular reproductive method in the Saharan Cypress, Cupressus dupreziana. The second process that is referred to as androgenesis or androclinesis involves (artificial) culture of haploid plants from anther tissue or microspores. Apogamy: Although this term was (before 1908) used for other types of apomixis, and then discarded as too confusing, it is still sometimes used when an embryo develops from a cell of the megagametophyte other than the egg cell. In flowering plants, the cells involved in apogamy would be synergids or antipodal cells. Addition hybrids, called BIII hybrids by Rutishauser: An embryo is formed after a meiotically unreduced egg cell is fertilized. The ploidy level of the embryo is therefore higher than that of the mother plant. This process occurs in some plants that are otherwise apomictic, and may play a significant role in producing tetraploid plants from triploid apomictic mother plants (if they receive pollen from diploids). Because fertilization is involved, this process does not fit the definition of apomixis. Pseudogamy refers to any reproductive process that requires pollination but does not involve male inheritance. It is sometimes used in a restrictive sense to refer to types of apomixis in which the endosperm is fertilized but the embryo is not. A better term for the restrictive sense is centrogamy. Agamospecies, the concept introduced by Göte Turesson: "an apomict population the constituents of which, for morphological, cytological or other reasons, are to be considered as having a common origin," i.e., basically synonymous with "microspecies. ↑ Winkler, H. (1908). "Über Parthenogenesis und Apogamie im Pflanzenreich". Progressus Rei Botanicae. 2 (3): 293–454. 1 2 Ross A. Bicknell; Anna M. Koltunow (2004). "Understanding Apomixis: Recent Advances and Remaining Conundrums". The Plant Cell. 16 (suppl 1): S228–S245. doi:10.1105/tpc.017921. ↑ Clausen, J. (1954). "Partial apomixis as an equilibrium system". Caryologia. 1954, Supplement: 469–479. 1 2 Savidan, Y.H. (2000). "Apomixis: genetics and breeding". Plant Breeding Reviews. 18: 13–86. doi:10.1002/9780470650158.ch2. ↑ Steil, W.N. (1939). "Apogamy, apospory, and parthenogenesis in the Pteridophytes". The Botanical Review. 5 (8): 433–453. doi:10.1007/bf02878704. ↑ Niklas, K.J. (1997). The evolutionary biology of plants. Chicago: The University of Chicago press. 1 2 Maheshwari, P. 1950. An introduction to the embryology of the angiosperms. McGraw-Hill, New York. 1 2 Rutishauser, A. 1969. Embryologie und Fortpflanzungsbiologie der Angiospermen: eine Einführung. Springer-Verlag, Wien. ↑ Fitting, H., et al. 1930. Textbook of botany (Strasburger's textbook of botany, rewritten). Macmillan, London. 1 2 3 4 Nogler, G.A. 1984. Gametophytic apomixis. In Embryology of angiosperms. Edited by B.M. Johri. Springer, Berlin, Germany. pp. 475–518. ↑ Carman, J.G. (1997). "Asynchronous expression of duplicate genes in angiosperms may cause apomixis, bispory, tetraspory, and polyembryony". Biological Journal of the Linnean Society. 61 (1): 51–94. doi:10.1111/j.1095-8312.1997.tb01778.x. 1 2 Nygren, A. (1967). "Apomixis in the angiosperms". In W. Ruhland. Handbuch der Pflanzenphysiologie. 18. Berlin: Springer-Verlag. pp. 551–596. 1 2 Koltunow, A.M.; Johnson, S.D. ; Bicknell, R.A. (2000). "Apomixis is not developmentally conserved in related, genetically characterized Hieracium plants of varying ploidy". Sexual Plant Reproduction. 12 (5): 253–266. doi:10.1007/s004970050193. ↑ Christian Pichot; Benjamin Liens; Juana L. Rivera Nava; Julien B. Bachelier; Mohamed El Maâtaoui (2008). %7C doi: 10.1534/genetics.107.080572 Genetics January 2008 vol. 178 no. 1 379-383 "Cypress Surrogate Mother Produces Haploid Progeny From Alien Pollen" Check |url= value (help). Genetics. 178 (1): 379–383. doi:10.1534/genetics.107.080572. ↑ Christian Pichot; Bruno Fady; Isabelle Hochu (2000). "Lack of mother tree alleles in zymograms of Cupressus dupreziana A. Camus embryos" (PDF). Annals of Forest Science. 57: 17–22. doi:10.1051/forest:2000108. ↑ Pichot, C.; El Maataoui, M.; Raddi, S.; Raddi, P. (2001). "Conservation: Surrogate mother for endangered Cupressus". Nature. 412 (6842): 39. doi:10.1038/35083687. 1 2 Solntzeva, M.P. (2003). "About some terms of apomixis: pseudogamy and androgenesis". Biologia. 58 (1): 1–7. Bhojwani S.S.& Bhatnagar S.P. (1988). The Embryology of angiosperms. Vikas Publishing house Pvt.Ltd. New Delhi. Heslop-Harrison, J. (1972) "Sexuality in Angiosperms,"pp. 133–289, In Steward,F.C. (ed.) Plant Physiology, Vol. 6C, Academic Press New York.